In this case, the property list was in a pdf (so it has be extracted, often not easy) and the city's real property database (which has a lot of interesting info) makes it hard to pull data from it. 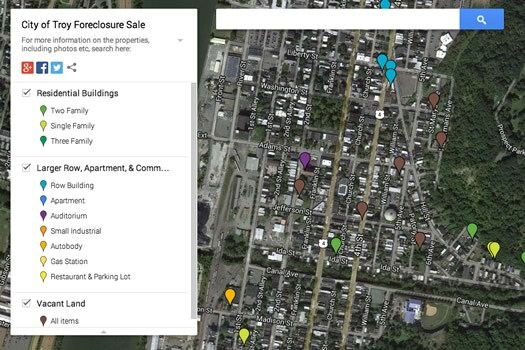 program that takes a list of tax parcel IDs like the sale list and uses the GIS database to make a map and the Real Property Database to populate all of the data automatically." Why should a city go to the trouble? Well, on a philosophical level, this data belongs to the public and making it hard to use it is like building a park with a fence all the way around it. But there are practical reasons, too: It makes it easier to find and do stuff! And this case, that would be making it easier for people to find a property they might be interested in buying. And Troy could really use property buyers, because it's seriously scraping for money right now. Another practical reason: There are tech-savvy, civic-minded people who can and want to help! We know of at least two such people who looked at this list, figured it could be better, and did something about it. Cummings is one -- Tim Varney is the other, here's a map he sent us. Taking steps to make public information more accessible will require some effort on the part of municipalities, especially at the start. But it might be easier than people imagine. Some of the tools available -- like Google Docs and Fusion Tables -- have become so easy to use that someone with even just a little bit of training can create something useful. And a possible side effect of opening up this sort of information: It gets more people involved, which can also be a good thing. [H]aving been through the purchase process once before, and watched it for a while, I have a few thoughts on that too. Primarily: what is really needed is to stop treating these buildings like an episode of storage wars, and make a reasonable assessment of the structural and interior state of the buildings available to people before they buy them. Even if "showings" aren't possible with current staffing, we should be adding a sale fee onto every building that is enough to pay for a basic assessment and documentation of the current state and potential. The current system favors insiders too much. Not just in the relative inaccessibility of the information, but also in the bidding process. These banks are a different approach to the problem -- it will be interesting to see if they can make any progress. "Local municipalities often post information/data in ways that make it hard to find or use." That's the primary reason why I converted it into a map. I looked at the pdf and was instantly frustrated. It took me only 20 minutes to extract the data (the hardest part) and create a map. Had I access to the raw data, it would have taken less than 5 minutes (as pointed out by Anasha). It's not that hard to do with a little knowledge. Kudos to Anasha for taking it a step further and improving the data and visualization. This is great, I wish someone would do this for Schenectady! Perhaps the new Troy Landbank can arrange to have the foreclosed properties shown to facilitate the best buyers for the properties, since the city doesn't have the resources. 2 young couples buck trend and plan to put down Collar City roots"